You will see that the bigger the size of a particular organization, the more is the scope present to employ different people in it who have specializations in the different areas of the HRM sector. There are some companies which employ specialists is establishing relationship between the employees and the customers. Here lies the tradition of engaging in bargains. It is ensured that satisfactory results come for the company after all the negotiations have been completed. The different specialists are also required to provide some information regarding the different legal proceedings in progress. Different arrangements are also made regarding consultations, the amount of involvement that the employees would also get into is also hence determined. An area of specialization that many people have looked into is in the training as well as overall development of the people. In the present times, the outside providers handle these things; however there exists a role for different trainers who have made it on their own. You will find that in the trend of the present times, the word manager is often replaced by the word consultant. The specialist, who excels in training, is given this particular name. This name defines the role of this person too. Hence the managers of the present times determine for themselves, the kind of training they will provide. This is a far cry from the previous method in which the trainers followed a typical portfolio where the courses and similar tings to be imparted were listed. Different specialists of the HR have a big role to play while recruitment of employees and the selection process is in progress. The welfare of the employees, their heath as well as the compensations they receive, are all looked after by the managers at the HR. Other than the specialists, many other people too are having certain roles to play in the HR department. These people can usually be found to work alone or in very small groups and carry on with the different HR based activities. They usually achieve all the objectives that are set for them. The different big business sectors employ the HR people to look after big projects. For example they may be looking into all the matters concerned with people employed in the agency as well as look after the entire HR issues prevalent in the area as a whole. There are some junior roles on offer for them too. In these tasks, the different administrators of HR take up the tasks which have been mentioned in the beginning of the chapter. By looking at the Fig 1.1, you will have a summary of the different roles that may be required to be performed by the HR people and the objectives that they need to achieve. The different HR professionals, who have worked at the senior most level, can now be termed to be qualified professionally as they have the membership of CIPD with them. There are lots of optional subjects that these people can choose for giving the examination of the institute. This is quite significant for those people who want to make a career as a specialist. The people looking to have generalized jobs need not appear for these examinations. There are lots of small business houses in the market which cannot afford the people of HR at all. They may use the help of these people as occasional consultants and take the advice regarding certain proceedings. The computer of the bank will hence be used to develop a payroll. The activities of a manager will always have reflections of a person associate with Human Resource Management. There are lots of HR roles being discussed here. Which role according to you would be the most interesting one to undertake? You have the options of choosing a generalist role, role of a specialist or that of a consultant. State the prime reasons behind you’re making a particular choice. There is a second implication of the term HRM which is also associated with it quite often. This describes a particular manner in which lots of different activities would be carried on. The approach taken by HRM is hence different from the one taken by the people involved in personnel management. When moved from personnel management to HRM, there occurs a basic shift which the different commentators do not strictly agree to. There are lots of people whose sole focus has been maintaining a management of the different relationships at the work place which has ultimately led to the rise of the Human Resource Management. This has happen in the last two decades or so. Hence those two decades of the 20th century has itself given birth to something new and different from the age old practices of personnel management of the olden times. The personnel management, has been deemed to consisting of the theme which is more focused on the workforce of individuals. 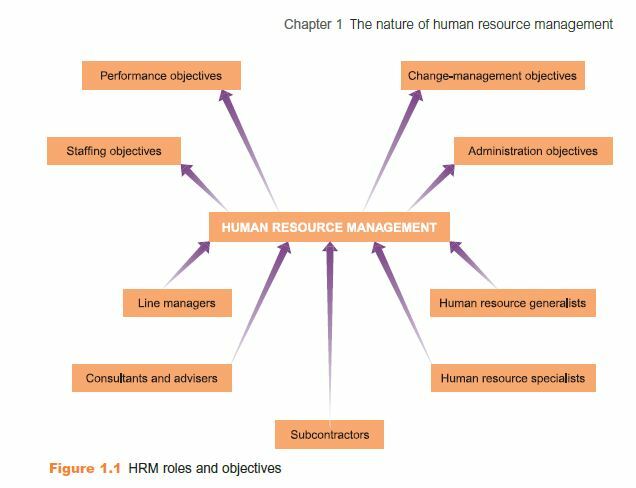 However the HRM approach is very much centered on the different resources. The people, who are specialists at personnel management, only go about putting in their effort towards the different employees present in the company. These employees are earmarked and looked after. The training of these people is looked after, and various arrangements are undertaken to ensure that they are paid adequately. The different steps or actions that the company’s management takes, is explained to them. Hence the various employees are kept satisfied by this approach. The different expectations that the people have from them is also made known to them. All the problems of the employees are hence taken care of and the management is always notified regarding the actions which could cause an adverse response from the different employees. The various people working in the companies are treated as a starting point for the activities of this management. They can also be considered to be a resource which is not quite flexible when compared to others such as money as well as raw materials. It can arguably be said that personnel management is a function if management. However it is not completely equated with different management interests. Different sales representatives need to understand the wants and demands of the customers. Similarly the people engaged in personnel management, have to understand the demands of the workforce of the company. These people actually work as mediators between the workforce and the company’s management. They look after the needs of both. In contrast to this, the people at HRM have been told to look after the entire human resources of the company and not only the employees. The main point of this kind of activity is to look after the demand rather than dealing with the supply. A lot of focus is given on the planning of different activities as well as controlling, rather than following the middle path. Different problems are solved, by discussion with the other members of the management team rather than discussing it directly with the group of employees or even people representing the workforce on the whole. This kind of function is completely equated with the interests of the management. It is quite away from the interests of the workforce. In the year 1987, David Guest laid emphasis on the differences that existed between the different models where he explained the existing stereotypes between personnel management and HRM. You can refer to Fig 1.2 for more information. There exists a point of view which is alternative in nature and it has the ability to recognize the various differences that existed between HRM and personnel management. Reaching this kind of conclusion is very much possible when focus is given on what the personnel managers and the HRM people do during their working hours. Different developments that are taking place in the sector of establishing relation between the employees are taken into account here. In the years 1989 and 1995 Legged, there exists a minimal amount of difference between the two things. However the differences that do exist are quite important in nature. You will see that the HRM is more thoughtful about what is being done to the different managers rather than what the managers are doing to the rest of the employees. The line managers here have a really big role to play and they have to remain active throughout. The management culture is one of the top most priorities for the HRM and hence this will be dealt with in the later part of the book. HRM can be seen as a kind of change that has crept into the market, it is actually a development that has been a characteristic of management of personnel in the business. All this evolution took place in the previous century. HRM can be referred to as the latest development that can be supplemented to a particular previously decided role and has actually developed by going through different directions in the long history of development. In the paragraphs that follow, the four stages in the development of personnel management has been discussed. In different websites, you are going to view what journalists have to say regarding the contemporary nature of HRM.